Aquatech Dive Center is dedicated to producing safe, knowledgeable and skillful divers. These three components are the important keys for developing competent, confident and comfortable divers, who can fully enjoy the exhilarating experiences of advanced and technical diving. We believe that knowledge and understanding equates to safety. Knowledge develops greater confidence and understanding of both the enjoyment and risk aspects of safe diving. Skills and stress management are important in the performance of safe dives and in the ability when faced with stressful events in the water. Our courses are organized to develop superb water skills and relaxed and comfortable divers. To reach this level, techniques are taught and drills are incorporated to enable divers to realize their full potential. The confidence developed in this type of training will reward students by allowing them to become self-confident and self-reliant divers. Equipment configuration and familiarity exercises are included to allow divers to build confidence and capability to reach automatic responses while working with their gear. Stress management skills are placed into our courses to simulate realistic diving emergencies. Their purpose is to train divers in response awareness, and to develop a memory of having experience a similar event before. Aquatech believes confidence and efficiency are developed by spending time in the water. Bottom time and a certain # of dives accomplished, help acquire these goals. Aquatech believes basic survival skills must be PRACTICED until they become reflex reactions. Aquatech believes diving is a risk activity and, thus, divers must be aware of the risk. The more advanced the diving styles, the more polished the skill level of divers must be to provide safety. Upon course completion, Aquatech requires students to complete a written exam as our only means of measuring their knowledge level. The purpose of this level of training is to give the cave diver a base knowledge and minimum understanding of the skills and specialized techniques required to effectively and safely use a diver propulsion vehicle in the cave environment. Can combine with another cave specialty course. The purpose of the stage diving course is toincrease the knowledge of the certified cave diver in extending their bottom times or safety in the cave environment For the reasons of longer penetrations, complex dives or any task requiring extended time. This course is designed to provide the cave diver the opportunity to continue their education in diving small caves or learning to conserve the environment by advanced buoyancy skills, the fundamental basics of side mount cave diving. An alternative gear configuration and gas management system for diving in unusually confined cave environments. • Depth 130 feet • Air rules 1/3 air rules are maximum for all bottles on all dives. If any unusual drills are to be conducted or abnormal diving conditions exist, it is suggested that the 1/3 air rule be modified with a minimum of a 200 PSI adjustment • These air rules may be modified to a more conservative model at the discretion of the instructor • Minimum starting visibility is twenty (20) feet. Description: The purpose of this course is to expose the trained cave diver to the basic fundamentals of survey in the phreatic cave environment. This course will promote safety and accuracy in a standardization of cave survey. 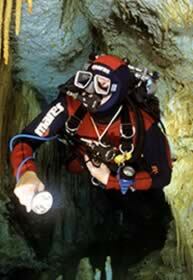 The intent is to develop a better understanding of the caves, and better use of maps in dive planning. The participants will understand a new importance of buoyancy control and clean/efficient equipment configuration.